Today it’s a school-sanctioned field trip. What can go wrong? Soaking Up the Good Luck? The goal this time is to go “Good Luck Orienteering” on a nearby mountain, visiting power spots to try to fill up their luck gauges. And again with groups of 2 or 3, we know what the groups are going to be. But things don’t go well from the beginning for our heroines, as Hanako’s boundless enthusiasm to do things ends up with her picking the last slot for their team, which means that the blinged-up Timothy will be following along behind them with his cheap gold paint job. And of course, Botan is not really made for walking, especially after her poor decision to bring along way too much equipment. 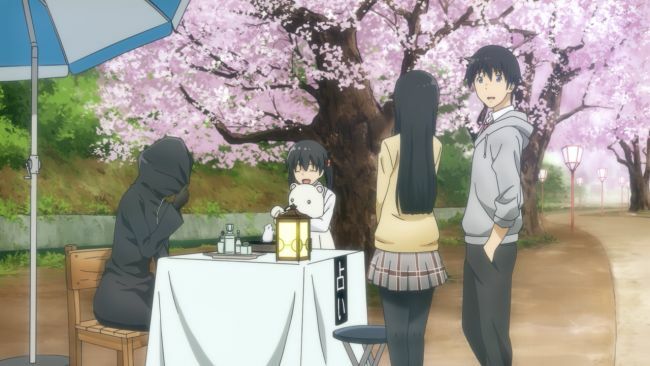 And far from being a place of good luck, they’re beset almost immediately with bad luck omens to alarm Hibari: A parade of black cats walking across their path to, er, interact with Hanako, and both of Botan’s shoelaces breaking. And it doesn’t get better as Hanako falls through a bridge and then the whole group is trapped on the bridge by monkeys. I guess they used the distraction to steal Hanako’s lunch out of her backpack, cause they never really show any mechanism for that to happen, but when they all get together for lunch they have to share. And it’s a good thing that Hibari and Botan have large lunches, because Hibiki’s effort to make sandwiches for Ren has gone horribly wrong as well despite her reading an “Easy Cooking” book earlier. I guess her inability to follow directions is more broadly applied than just her location. What’s he doing way out here? But the real crisis happens when Hanako splits from the group to wash utensils. On top of being a pointless thing to do (because there’s no way that any mountain stream is what we think of as ‘clean’), she then disappears, leading to an all-hands effort to find her. 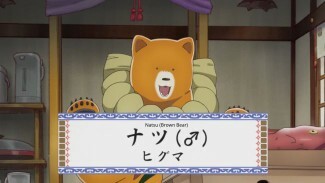 The biggest help comes from Hibari’s “boyfriend”, as Botan calls the appearance of a construction sign in the woods, who helps them notice where Hanako is. But even after they find her, they’re not out of the woods yet, so to speak. Because it’s this group, a bear that escaped from a local (Petting? Really?) zoo has found them. 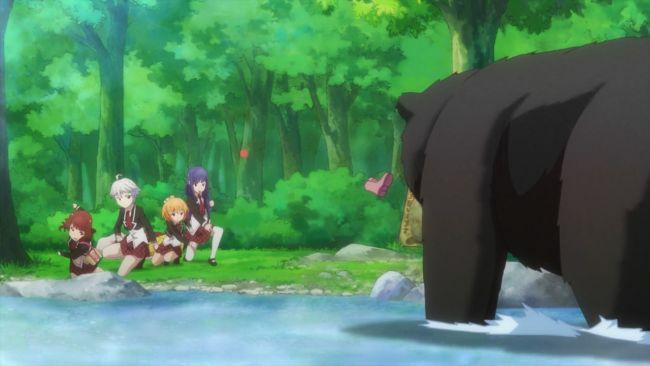 But now we see the special skills of “Killer” Kodaira, who takes the bear down before it could harm the girls. In the end, noone was hurt, and the group of girls had an adventure and made more memories for Botan. Hibari might not think it was particularly relaxing, but I think she felt like they ended up not having a bad time. Why are you carrying her?!?!?! Carry me! There were a couple non-standard sequences that I wanted to point out, because I thought they really stood out as some fun parts of this episode. The first one was the escape from the bridge, where we get to see a traveling shot of the five girls running across the bridge. Hibari and Hanako in the lead, with Hibari’s usual awareness of the situation contrasted with Hanako’s “this is fun!” experience, then Botan’s struggles to run, ending in her collapse, only to be picked up by Ren, the one who is always saving whoever needs it. Which of course earns the ire of Hibiki, who wants to be princess-carried by Ren herself. But the whole shot takes 8 seconds (4 of which are Botan’s janky running) and manages to work in both everyone’s personality and the sense of excitement the scene needs. Good work. The second shot that really felt non-standard, but got an interesting laugh from me was when Hibiki and Ren walked up behind Hanako at lunch time. Instead of turning around, or not doing anything, Hanako leans her head waaaaaay back to talk to them as the camera pans up, giving a perspective we almost never see in anime. It also made her look a bit like a Peanuts character, but I thought that was part of the charm. And they carried her pose over into the next shot, where the perspective changed to show her looking back at the two on the edge of the blanket, as part of their invitation to eat lunch. We never see anime characters lean their heads back like that, and I thought it was interesting and fun. …Bears in a petting zoo. That somehow seems fitting for the world this anime is set in. That sign didn’t do anything to you. Just leave it alone. The kami of misfortune is cruel. I can imagine all the bento from the entire class becoming afflicted somehow, except for Hibiki’s…they allow that to arrive to the camp unmolested, whole, and probably even fresher than when it was made.